Growing oranges for money may seem to be a daunting task and indeed the art of starting an orange farm requires patience and a basic knowledge in planting and maintaining orange trees. To help you in this journey, here is a short introduction and some basic information in growing oranges. Growing oranges for money requires patience and knowledge in the basic skill needed for planting, cultivating and maintaining orange trees. Certain factors need to be taken into consideration before growing orange trees and starting an orange farm. Not only growing oranges take years to bear fruit, the right kind of soil, climate and irrigation must be observed for optimum results. To give you an idea of what to expect in growing, here is a brief introduction of the basic process in starting an orange farm. The first thing to consider in planning an orange farm is the climate. Most citrus trees require a tropical or warm climate. The same goes true for oranges as orange trees tend to die during the cold season. It is thus vital to find a location where the climate is tropical or subtropical. Finding the proper kind of soil is also one of the key factors in planting orange trees. These trees must be planted in soil with good surface and internal drainage. Surface drainage means the ability of the soil to prevent water from staying around the tree whereas internal drainage is the ability of the soil to absorb water downwards. This is important as orange trees should not be soaked in water. To test if the soil has proper drainage, dig a hole one to two meters deep and see if the water drains after 24 to 36 hours. Also make sure that the acidity level of the soil is not more than six to eight ph. It is also very important to consider the natural landscape of the land area you are considering in starting your orange farm. 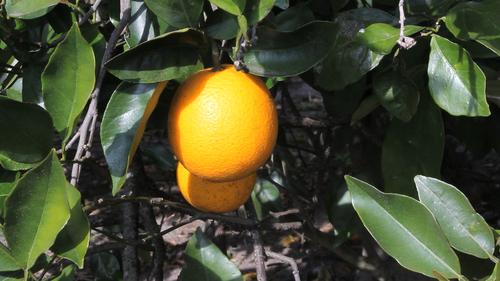 The landscape, slope, wind direction, and sun exposure are only a few things to consider in spacing your orange trees. The space between trees and rows are important in terms of absorption of sunlight, water, air and easy access of labor and equipment. There are varied ways of planting these trees. The preferred way is the use of seeds but this takes years before it bears fruit. Plant the seeds where the soil has already been mixed with compost and organic material. Make sure that the area gets much sunlight and water. Put mulch to conserve water. Water the young tree two to three times in its first week and once or twice in the succeeding weeks. It is important to keep the area of the orange trees free from weed for their continued growth and healthy development. is it possible for oranges to survive, even if they do not nourish, in very cold or very hot (4 to 35 degrees Celsius) conditions? i have 2 acre land sand soil at visakhapatnam,i want to know is my land is suitable to grow orange plantation are not. I have an one acre piece of land in siaya kenya. if I invest in orange farming can it give returns? the area is hot with loamy soil. how many trees will be viable? Am interested in setting up an orange farm in a 20 acres land in Botswana.Please help me with important factors to consider. Help me with necessary equipment for orange production. I have planted 100 orange trees and i have noticed that about fifty are growing well but the other fifty do not look healthy even though i give them same amount of water. What fertilizers can i use? how often? Hi! Am living in Tanzania dodoma, I have a farm planning to grow oranges and mangoes, but I do not know the space between the orange trees in the farm. Can you help me please? Thanks. i've orange farm around 2000 trees. every year we have around or sell our oranges at about 30 lakhs, we sell it to some vendor. but i wish to start up my own business with my oranges. please suggest some business ideas. I have 5 acres farm and want to start Orange farming. I would like to learn more on how to manage the farm. My farm is located in Makueni County, Kenya. i am from makueni county and i grow oranges and mangoes at a large scale. am looking for market of ks.30 and above per kilo of oranges. mangoes ks..8 per piece. please help. i can get 8000 kilogrames of oranges per season and 10000 pieces of mangoes. farmers in makueni are badly exploited by brokers who pretend to be business people. please assist urgently. I have just started growing oranges and mangoes 300 & 100 respectively. I have 6 acres on which I plan to grow as many more orange and mango trees and I would like to get a way of having these trees irrigated throughout the year can you advise on what equipment/technology I can use and how to acquire it. I COME FROM Kumi district in Uganda where it is literally dry for more than half the year hence no fruits at that time. I will be grateful for good assistance. I am interested in starting orange farm. I am in Makueni County, Mbooni East District, Kisau Division, Kisau Location. Kindly advice. I have already started an orange farm 3 acres but am planning to add more 3 acres, but am looking for money to buy equipments for irrigating bse our exp rain shortages in a year.I am in Uganda country,Kampala city,Kamwenge district,Mahyoro sub county. Hi my name is john muli i have two acre land in kwale shimbahills. i would like to know the best orange farming practice. How many orange trees do I have to plant in an acre? Will I be able to get market for the produce when harvest comes? How much money can I expect in an acre? How can I get a cheaper irrigation system such that even in a dry season I would still not be affected? Am interested in setting up an orange /Anar farm in a 10 acres land in chandrapur dist. maharashtra state. Please advise me to proceed further. This was a good tip for me. I am planning a 5 acre orange garden as part of my orchard in Western Uganda , Isingiro District 15 miles from Mbarara the regional city! I need advice on how to go about it. Do you know the nearest right institute or company from which I can get advice, seeds, inputs or I can get the advice online! hello there thanx 2dis info.site.Please advise on what fertilizers and seedlings to suit on my 3 acre land, then the spacings and the number Orange trees on each acre. Also Where i can find the fertilizers/seedplants and advice in my country uganda. I'll be grateful on receiving your kind advise before i start, thanks. I am kenyan living at the coast region. Able to supply oranges in tones to any part of the country and outside the country too. Orange type (msasa). contact me via +254726006498 texting or by calling or email me at sammyngare@ymail.com incase of any demand or incase you have the knowledge of the markets. I Have Many Orange Seedlings I'm Looking For Market .I Have Good Ochard Of Oranges. Cont 0773232325. I come from Kamuli district Uganda. I would like to know the following about orange growing; Best variety in terms of market availability. Recommended spacing Yield per acre per harvest, Time to maturity, How many harvesting seasons exist after maturity. Thank you in advance. I have a two acre farm at Makueni County. a place called Kalamba. I have seen Orange tree doing well here. I would like to do a professional job in orange farming. kindly advice me on the premium variety for the area, and what it would take and the projected income. Hi, I need more information on orange farming in Nanyuki. Please get in touch on email. Thanks in advance. I grow oranges in Zambia . I have 800 plus trees but the challenge I have are fruit flies which devastate my yields . Please advise. hi am emmanuel from western part of kenya in busia county i have an ambition of doing agribusiness in oranges and mangoes plantation in my 1/2 an an acre. But i dont know which breeds could be suitable to produce high yield in this geographical area of warm and wet climate. pliz i need your help before commencing on the project next yr if God wishes ,thank for the support. i am Paul Nderitu from Kenya nyeri karatina ( central Kenya). want to be an Orange farmer please advice on the best variety and how to do good farming practices, diseases and pest control methods.thanks. i have this vision, need advice in caring the orange trees. I would like to know how I can get scion from the south African Orange not the green one st Kenya Thika. I'm Angaine lekishon, from sultan hamud, kajiado county. I have two acres of land and need to plant orange trees. Please advise me the best variety or varieties and how to get.